Careful, Don't Dent The Espada With The Kia's Door! 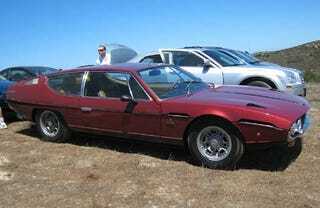 After getting a Lamborghini Espada for yesterday's Project Car Hell, I remembered this Espada we photographed in the parking lot at the Monterey Historics last summer. We were driving a plush Sorento, provided by the nice folks at Kia, and look what rumbled up and parked next to us!